A hiking clothing layering system will save you time, make you as comfortable as possible in challenging trail conditions, and will keep you safe when you have to stay out overnight on an unplanned bivouac. That's why dressing in layers on a hike makes sense year round! Let's look at what a hiking clothing layering system is designed to accomplish. Then we'll turn to getting your layers up to speed, so you can tackle any trail conditions you encounter. Why bother with a hiking clothing layering system? Because you're investing time in reading this article on clothes layers for hikers, I already know which category you are in, or are striving to join. So let's quickly outline the benefits of wearing hiking clothing that you put on, remove, adjust and always have handy in your backpack regardless of the weather. Define this layering system, please! But your search for the best hiking clothing layering system goes further than this. 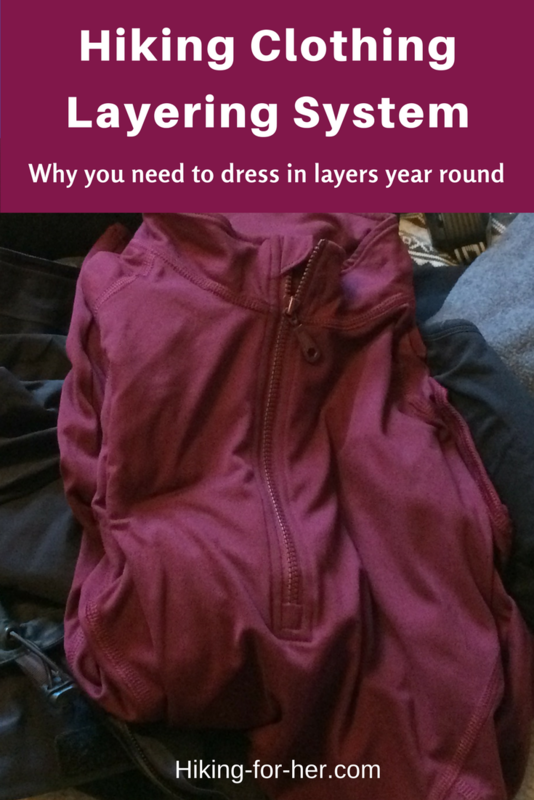 Let's go back through those 3 layers again for a closer look at how to dress in layers on a hiking trail. You might need a few tips on what to think about as you size up each layer, and Hiking For Her is here to deliver them. The inner layer for hikers is a moisture management layer. That relies on specific fabrics labelled for their moisture wicking ability. Resist the urge to put on every day or bargain bin clothing and hit the trail. Cotton does not do the job except in ideal summer conditions (dry and warm). Purchase clothing specifically made for hiking or some other athletic activity, because those fabrics will stand up to your sweat. Don't forget that you'll sweat on cold weather hikes and during snowshoeing, so you'll want a moisture wicking inner layer next to your skin. If you're up against really cold conditions, you'll want long underwear, both top and bottom. Details on handling cold weather hikes are here. And you might want these snowshoeing tips, too. For women hikers, the inner layer of clothing starts with a sports bra (recommended regardless of the generosity of your endowment, to prevent chafing), undies, and sometimes a warm sleeveless shirt (tank top) if you know you'll be wearing more layers. Or a wicking, light weight tank top might become your mid layer in warm weather. I also consider two layered pair of hiking socks an important base layer for hikers. Here's where your clothing becomes optional and customized. Only you know your comfort range and tolerance for temperature swings and moisture levels. So build in some customization in your mid layer. Choose fabrics that stand up to abrasion, dirt, moisture and frequent handling. The less fussiness the better: few or no buttons, lightweight plastic zippers that don't jam, no extra embroidery or doodads that can unravel, fall off or catch on branches. Don't choose bulky clothing for your mid layer, because you'll feel like a stuffed sausage and won't be able to move around in comfort once you add your outer layer. In cold weather, you can add a scarf around your neck that tucks beneath your outer layer. This is one of the most versatile pieces of hiking clothing you can own, because it can cover your head and ears as well as your neck. And it's so easy to toss into your backpack when you don't need it! For safety's sake, it's important to carry enough layers to meet the demands of changing weather and the daily cycle of temperature wherever you are hiking. One of the biggest mistakes I see beginner hikers make is to underestimate how much clothing they need to carry. If I had a dollar for every shivering, miserable hiker I met on the trail, I'd take you out for a really fabulous dinner - on my private jet winging its way to Paris. Now for a few words about your choices for each item in your outer layers. A jacket for a hiker means many things, but most importantly it means protection. And one jacket just isn't going to cut it (see the list above for what "it" might be, and all within one 24 hour period). Read my tips on choosing hiking jackets, and begin to build up a small repertoire of the best jackets for the type of hiking you do. Just as for jackets, you're going to need a selection of hiking hats that suit your hiking style. On my backpacking trips, I carry at least 3 or 4 different hats. They're lightweight, packable, and have literally saved my life when the skies open up and dump onto my head or I'm crossing shade-less terrain. Start your hiking hat collection here. I can't say enough good things about carrying a pair of gloves on every hike. If you don't need them to keep warm, you might need them to pick up something spiny or sharp. Just be sure they're lightweight, dry quickly, and are replaced when the fingertips get too thin. As with hats, I'm a bit of a glove collector. Read my tips for picking a pair right here. Rain gear for hikers - so important! A classic mistake is to forget your rain gear because the sun is shining brightly before you reach the trail head. Mother Nature loves to mess with us hikers, and one of her favorite ways is to gather some thunder clouds later in the day and watch us shiver. So don't neglect to carry your rain gear, using these tips. specific clothing in each layer? I only wear what works, and what works is what I've tested while hiking thousands of miles in all kinds of conditions. 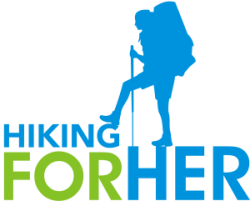 My top picks for women's athletic clothing for hiking can be found here. Lots of tips for choosing great hiking clothes are here. Hop over here for the sun protective clothing I know will protect your skin. Layer up and hit the trail! Now you know why you need to dress in layers while hiking. Let me know if you have questions about specific choices for your hiking clothing layering system. Use the Ask A Question link below on the left.